Living Area: 3252 sq. ft. Lot Size: 13,400 sq. ft. 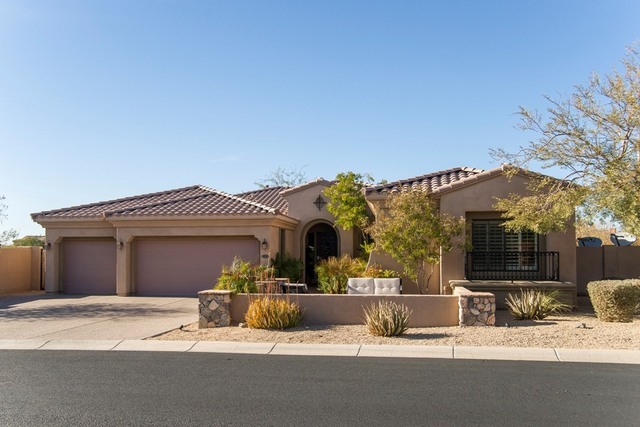 This impressive, spacious home is located on a very private lot with a wash on both sides and is in a guard gated community with multiple pools and clubhouses. The large backyard has a play area, covered patio and a great fireplace for entertaining. The gourmet kitchen with granite counters, double wall ovens and pantry is open to eating area and family room which brings everyone together. The 4th bedroom has French doors making it a great option for a den. Master suite has a jetted tub, separate shower and two vanities. Easy access to the 101 and shopping nearby makes this home very desirable. Shows like new but has the move in ready features of a washer and dryer and window coverings!